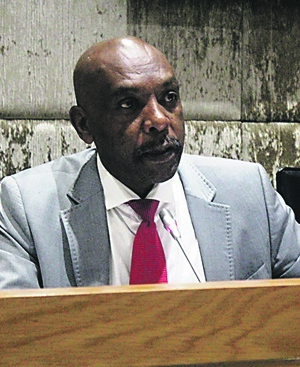 President Cyril Ramaphosa did not overreach the authority of Parliament - and its land expropriation hearings - in public remarks he made via the national broadcaster on Tuesday, African National Congress Member of Parliament Vincent Smith told Fin24 on Wednesday morning. On Tuesday evening Ramaphosa, in his capacity as president of the ANC, told South Africans during a SABC broadcast that the ANC would finalise constitutional amendments needed to allow expropriation of land without compensation. His remarks evoked strong reactions, with some questioning the point of having Parliament hold hearings on whether it was necessary to amend section 25 of the Constitution to allow the state to expropriate land without compensation in the first place. Other critics strongly questioned the perceived conflation of party and state when Ramaphosa used a platform usually afforded to the head of state to address the country in his capacity as the president of the governing party. Opposition DA leader Mmusi Maimane on Wednesday issued a statement saying Ramaphosa's remarks were a "direct attempt to undermine Parliament", and contributed to "no confidence in the economy". "This is yet another blow to the almost 10 million unemployed South Africans," he said. Maimane had written to Speaker Baleka Mbete to request an urgent sitting of Parliament to deliberate on the matter, he said. "It beggars belief that while there are still half a million submissions to be processed by the Constitutional Review Committee, and no less than five public hearings still to be conducted in the Western Cape, the ANC has decided to jump the gun, undermine this public consultation procedure, and render the entire process moot." Smith told Fin24 that while he did not follow Ramaphosa’s statement in close detail, he considered the president’s remarks as a function of party politics finding expression on the issue of land expropriation. "My understanding is that the president said they [the party] support an amendment, should it happen. We have no problem with parties speaking to their base supporters. That does not influence the 400 people that must decide at the end of the day," said Smith. He said other political parties were allowed to express their views on the matter, and that Ramaphosa was a political leader before he became president of South Africa. "There is no problem with the political party officials [nailing] their colours to the mast. Nobody asks why the DA does not support these amendments to the Constitution. Nobody asks why the EFF is in support of this. It is a function of party politics," Smith said. Smith added that he was pleased with the submissions Parliament received during its nationwide hearings to canvass the views of ordinary South Africans on the need to amend the Constitution so as to allow the state to expropriate land without compensation. "They have met expectations. I have been saying that the meetings have three points. Firstly, we underestimated the interest of South Africans. We budgeted for 300 submissions but have been oversubscribed at every stop," he said. The hearings produced thousands of submissions, he said. Secondly, he added, he was pleased with the sound arguments presented by South Africans, and thirdly, the tolerance they displayed when hearing views they disagreed with. "Both sides of the debate have clearly thought out their arguments. Some are arguing on the side of poverty that is associated with landlessness and other have argued for the stability of a currently vulnerable economy," he said. He said from August 7 - 17, the committee would go through written submissions in Cape Town. After studying written submissions, in September the committee will review submissions from the hearings and submit its report to Parliament at the end of September.